As a fast and furiously hectic (but hopefully successful) art week in Hong Kong comes to a close, we take a fun look back on some of the things that went amiss, some to our amusement, some to our annoyance, and some just simply beyond our comprehension. Who doesn’t love a freebie? If you work in the art world, no doubt you get inundated with requests by loved ones and those who magically reappear in your life this time every year. Everybody wants to be a VIP. Everybody suddenly loves art and wants to see the fairs. As if your job wasn’t already busy enough! It’s ONLY the busiest week in your calendar. But apparently, even if you manage to convince that friend-whose-name-you-forgot to buy a ticket, their HKD$400 wouldn’t be welcomed by Art Basel anyhow. The limited ticket supplies that are always immediately sold out tells us Art Basel is in no shortage of cash. They do, however, seem to forever be short of celebrity VIPs. Talk about exclusivity! So you dished out a not-so-small fortune to pay for a booth at Basel, and you’re ready to make a killing, it’s the VIP Preview and the Hunger Games have begun—the fair is now your arena. Ah, but what is that fly annoyingly buzzing around your ear? It’s definitely a competitive world out there and business isn’t just restricted to the booths. 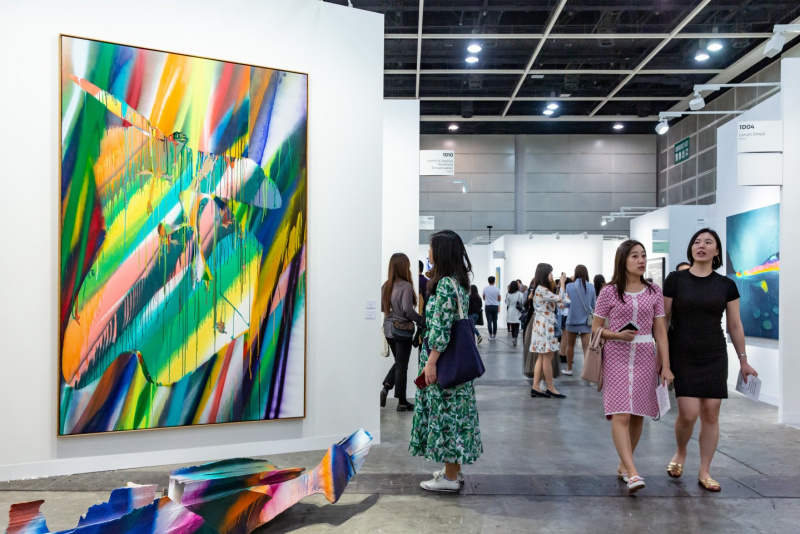 That buzzing becomes more incessant as you spot gallerists-without-a-booth, art ‘dealers’ and self-proclaimed ‘professionals’ roaming the aisles and VIP Lounge with iPads in hands. With rivals like these, it’s a fishy business for sure. Time to get out the mosquito bat you got off Amazon (or Taobao, it’s cheaper). You are tired AF, your feet ache, and your head is pounding. No amount of coffee seems to cure your hangover as you regret that fourth glass of wine last night. Now you are already fashionably late and desperate to get to your next event. Logistics are painful during art week every year, but an Uber from Central Harbourfront to the HKCEC should never cost HKD$200. Speaking of next level opportunism! Oh but wait, there’s more. It’s also a requirement that you need is to be teased by the blasted app telling you the waiting time is 5 minutes… 10 minutes later. Not to mention drivers cancelling last minute. What happened? Car broke down you say? Speaking of waiting, we admit, Hong Kongers love to queue. Nonetheless art week really removes the fun out of waiting in line. You’d have to be a total nutball not to be infuriated by the long queues at every opening, party and restaurant within walking distance. Did you see the unending line at Art Basel on the public days that wound all the way down to the HKCEC main entrance? Yea, we did too and if you decided to rip up your general ticket which you couldn’t pay for (see #1), we won’t judge. Pedder Building and H Queens didn’t fare so well either. Who wants to wait to get into the cramped lifts just so you can pop your head into overcrowded galleries? Who has the time (or the F’s) to deal with H Queen’s never-ending descent of some 17 flights of stairs. Lifts go up. Lifts come down. Simple right? So let’s make a deal H Queen’s. Next time, while you prepare to let the next group swarm up, first bring us, time-poor, overly important, art people down. It’s on the way, I promise. Queuing aside, Hong Konger’s seem to also love oversized inflatable toys floating in Victoria Harbour, which ironically people would queue to see. While the connection between giant floaties and contemporary art still baffles us, at least you found it totally Instagram-worthy right? And it seems the demise of Dutch artist Florentijin Hofman’s Rubber Duck in 2013 did indeed teach us a lesson on looking after our toys. For those who remember that adorable yellow thing, it sadly deflated like a fried egg on water just some two weeks after docking. This year, we were graced by the presence of KAWS’ Companion—his signature character with X’s for eyes—relaxing on his back in our Harbour. We hope you got to see him from your rather constricted office cubicle (maybe with X’s for your eyes) before he first got deflated a few hours after being dumped on the water, and was removed a couple of days early in anticipation of bad weather. Disappointing, we know, but at least he was spared the same fate as the rubber ducky! For better or for worse, contemporary art finally has its long overdue populist moment. It’s all about that special selfie with the untouchable artwork as your background or prop. Oh yeah, how cool would it be if that creepy monstrous sculpture would forever be the Beast next to you as the Beauty. As selfie-taking trumps the viewing of art, gallery staff are having panic attacks when you interact a little too closely with the artworks… God forbid you scratch it! You know there is a reason selfie sticks are banned by many museums and casino magnate Steven Wynn made headlines as the ‘40-million-dollar-elbow’. Forget the artworks, the real question is…did you manage to get a selfie with Jay Chou, Michelle Yeoh, or Pharrell Williams? Were you even at Art Basel or any of the A-list parties? Actually, if you didn’t take any selfies and post them on Instagram (#aboutlastnight) what is the point of going to an art fair? Do you even exist (insert eye roll)? 8). You’re the corner guest at a private dinner #seatfiller. Got invited to a dinner and seated at the furthest corner on the end of the table? You know who you are. Yep, that’s correct. The obligatory seat filler, merely the backup option. Not missed if you don’t attend. But who cares, it’s a free dinner and ah well, at least you were invited. Just coddle yourself at home and remind yourself that you are unique and you are special. From the mere peasant realms of the Collectors Lounge (aka VIP Lounge) that you sold your soul to get into, you longingly watch the mystical escalator that leads to a promised paradise – where champagne flows freely, desserts and dim sum appear at your behest, and stunning works of art from the UBS Collection surround you. Is it Eden? No. But close. It’s the uber-exclusive UBS Lounge, which can only be accessed by a special shiny white sparkly card. Don’t have one? Not a UBS VIP? Too bad, you can’t chill with the big boys. 10). Drink no more…until next week #LIVERFAIL. While I wouldn’t say we are alcoholics, it’s a safe bet to say art week goes hand in hand with booze. Ever been to an opening or an art party without booze? We didn’t think so. At least not in Hong Kong where free flow is a household term. Dinner receptions served without wine? What horror! Alas, with no shortage of art world events on the yearly global calendar, best to prepare your livers for that next big thing. Frieze Week and Venice anyone? We recommend you quickly get onto those liver detox supplements (Swisse make one) or a juice cleanse. Better yet, if you have the dough, hurry on to a detox retreat. The clock is ticking!